This CenterSOLUTIONS® Task Cards: Word Problems kit includes 100 individual math problems for first-grade students. 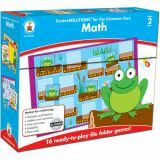 The math problems encourage success in grade-appropriate math basics such as addition and subtraction, properties of operations, counting to 120, place value, measurement, time, and geometric attributes. 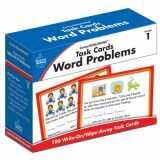 Students will enjoy learning with the colorful CenterSOLUTIONS® Task Cards: Word Problems. Each write-on/wipe-away card contains an engaging math problem that promotes practice and success in math! The set includes 100 4" x 6" task cards, each printed with a Common Core standard on one side for easy planning and progress tracking. 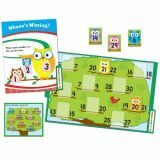 The cards are perfect for centers and learning stations, individualized instruction or skill differentiation, math journals, and much more. A free online resource guide provides a standards matrix, recording sheets, and an answer key. This CenterSOLUTIONS® Task Cards: Word Problems kit includes 100 individual math problems for fifth-grade students. 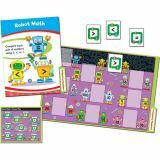 The math problems encourage success in grade-appropriate math basics such as numerical expressions, place value, operations with multi-digit numbers, decimals, fractions, measurement, and plane geometry. 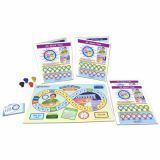 Students will enjoy learning with these colorful CenterSOLUTIONS® Task Cards: Word Problems. Each write-on/wipe-away card contains an engaging math problem that promotes practice and success in math! 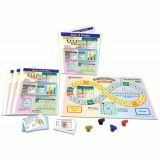 The set includes 100 4" x 6" task cards, each printed with a Common Core standard on one side for easy planning and progress tracking. 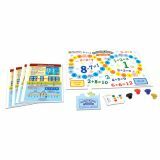 The cards are perfect for centers and learning stations, individualized instruction or skill differentiation, math journals, and much more. A free online resource guide provides a standards matrix, recording sheets, and an answer key.